Note: Manually specified featured posts take top priority. 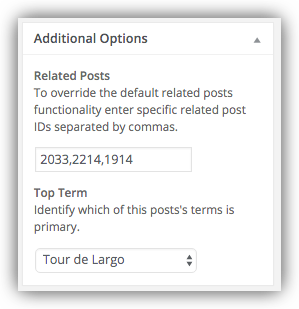 Otherwise largo applies an algorithm to select related posts based on taxonomy and post dates. If Largo doesn't find any editorially specified related posts (if that field is empty), it then looks at any series the post is assigned to and tries to first find the next (more recent) post in the series. If the post we're looking at is already the most recent post in the series, it will show the previous post in the series.